Wow! There are so many fun places and things to do in Long Beach California. From the beaches to the Queen Mary to the Aquarium of the Pacific, its easy to plan a fun-filled trip here. Come aboard the legendary Queen Mary where you'll get a glimpse into a bygone era when steamships were the most regal way to travel. 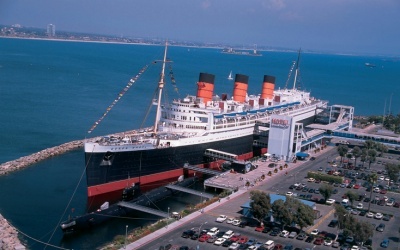 At one time, the Queen Mary was the grandest ocean liner in the world. Today, it is a historical landmark, entertainment venue and a full service Long Beach Hotel. Check out the GoCityCard for discounted tickets. The Aquarium of the Pacific - More than 11,000 animals in over 50 exhibits, touch over 150 sharks in Shark Lagoon, touch sea jellies in the Arctic and Antarctic gallery, feed colorful birds in Lorikeet Forest and so much more! Check out the GoCityCard for discounted tickets. Visit Santa Catalina Island - Just an hour boat ride off the coast of Long Beach to the picturesque town of Avalon. Catalina features the only zip line in Los Angeles County. The Catalina Express has up to 30 daily departures year round from ports in Long Beach, Dana Point and San Pedro. For more info call 800-315-3967. Don't like boat rides? Then fly over! Take an Island Express Helicopter and get there in about 15 minutes. I did this and it was a blast. Our pilot was very cool and hovered over a couple whales for us to view and take pictures. You can reach them at 800-228-2566. Toyota Grand Prix of Long Beach - So loud, but so much fun! Right in the midst of great restaurants, shops and the ocean and harbor are right there. Always big crowds, lots of speed, so many choices of what to eat and usually fantastic weather. Located at 3000 Pacific Ave in Long Beach, call 888-82-SPEED. Long Beach Waterfront - Plenty to do here! Dine, shop, walk, bike, people watch and the views here are really pretty. 54th Place and Ocean Blvd.